Last week, I was New Orleans for the NRPA Conference, along with about 7000 park and recreation professionals, students and educators and that doesn’t include all the vendors in the exhibit hall. One of my goals while there was to find a park for this week’s blog. I just didn’t know how easy that task was going to be. I walked past the park and stopped to take my first picture before arriving at the front door of my hotel. The view from my room overlooked the park, so I got to watch it early morning and late evenings as well. What made me stop and take my first picture was a sculpture outside the park entrance. It was a tree with a house up in the branches. I had found the Mississippi River Heritage Park. A park honoring the people and remembering the events that occurred on August 29, 2005 - Hurricane Katrina. This park is 1.36 acres and is directly across the street from the convention center. Surrounded by wrought iron fencing with six gates and entrances, the park serves the historic warehouse district and provides a beautiful respite for convention center visitors. It is the site of corporate and convention events, concerts, filming as well and serving as a wedding venue. I made it a habit to walk through or around this park every day at different times of the day to see what happens there. I saw a lady throwing a ball with her dog, conference attendees enjoying the sunshine and filming video for a work project. I saw people just being quiet and enjoying some outside time. On one of my visits, I saw two Public Safety Rangers and stopped to chat with them. The signs at the entrance gates clearly state the park gates are locked at night - and they were when I checked so I wanted to know who was responsible for the task of opening and closing the park. They told me the task is shared jointly between the Public Safety Rangers and the security staff at the convention center. Although NRPA did not hold an event at this park, I can see where it would be a great location to have an outside social if you were meeting at the convention center. Something that appealed to me about this park were amenities like benches and flower gardens outside of the locked gates so even after hours, you could enjoy the area. 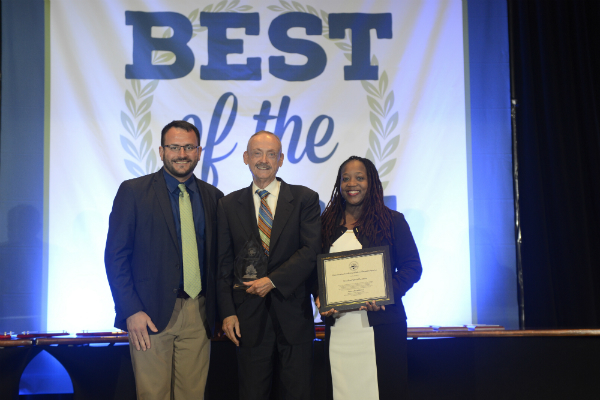 From agency accreditation, program awards, and individual awards, NC was well represented at the NRPA Best of the Best Ceremony in New Orleans last week. A special congratulations to all of those who received recognition. CAPRA Accreditation: Mooresville Parks & Recreation, CAPRA Re-Accreditation: Greensboro Parks & Recreation and Kernersville Parks & Recreation; COAPRT Re-Accreditation: NC State University Department of Parks, Recreation and Tourism, National Distinguished Professional Award: Dr. Phillip S. Rea, National Partnership Award: Durham Parks and Recreation, and Diversity Scholarship winner Kobeyeh Riley. We welcome Mooresville Parks & Recreation as the newest NC CAPRA Accredited agency in our state. What makes the Mooresville Parks and Recreation shine so brightly? It’s the little things and the big things, too. It’s programmers bringing play to underserved communities in a Mobile Rec Unit. It’s staff and volunteers growing hundreds of pounds of garden produce for the concession stands and community soup kitchen. It’s Wi-Fi and webcams throughout the park system. It’s thousands of people enjoying programs, parks, trails, community centers, ballfields, aquatic facilities and so much more. It’s a dedicated staff working every day to build a healthy and more livable community. And that is what makes Mooresville shine! Reaccredited this year we have Greensboro Parks & Recreation and Kernersville Parks & Recreation. Greensboro Parks and Recreation is located in the third largest city in the State of North Carolina. The department was formed in 1933 and continues to provide professional and diverse leisure opportunities through inclusive programs, facilities, parks and open space. It is dedicated to making Greensboro a desirable place to work, live and play, and its goal is to build better lives and a better community. The foundation of all programs, services, facilities, parks, and gardens is based on achieving the four pillars of CARE: Creating economic impact, Advancing conservation, Rejuvenating health and wellness, and Enhancing the quality of life. Kernersville Parks and Recreation is an integral part of the community. The department’s services increase the citizen’s quality of life as well as promote tourism into Kernersville. A staff of 15 full-time and 20 part-time employees manages eight town-owned parks, three joint-use facilities, two buildings, welcome signs, common green spaces, and landmarks. The department provides passive, active and cultural opportunities. Receiving their COAPRT accreditation is NC State University Parks, Recreation & Tourism Department. North Carolina State University: Department of Park, Recreation, and Tourism. Established in 1947 and first accredited in 1977, the Department was the first nationally accredited degree program of its kind in the United States. The department seeks to advance and disseminate scholarship concerning management and use of natural and cultural resources for recreation, tourism, and sport through research, teaching and public engagement. The department is dedicated to preparing students to be lifelong learners and leaders in a global society, committed to developing parks, recreation, tourism and sport resources that improve quality of life and are environmentally, socially and economically sustainable. Dr. Phillip S. Rea received the National Distinguished Professional Award. Phil Rea has served the field of parks and recreation as a distinguished leader, practitioner, and educator. He served as superintendent of one of America’s largest urban parks and as a faculty member at Indiana University and at North Carolina State University. He received the Distinguished Alumni, Hall of Fame and Outstanding Alumni Award from Indiana University, the Hall of Fame Award from the N.C. Recreation and Park Association and numerous other awards. He directed three schools at Oglebay, serving thousands of parks and recreation professionals. The National Partnership Award was presented to Durham Parks & Recreation. The mission of Durham Parks and Recreation (DPR) is to “Play More: Connecting our whole community to wellness, the outdoors, and lifelong learning.” The department strives to help citizens discover, explore and enjoy life through creative and challenging recreational choices that contribute to their physical, emotional and social health. DPR offers sports and recreational programs to improve fitness, cultural events to enlighten and educate, environmental education programs to explore the natural world and community-based celebrations to inspire civic pride. Kobeyeh Riley received a Diversity Scholarship. He has served the communities of Mecklenburg County and Mooresville in the administration, aquatics, parks, programs and therapeutic recreation divisions. He served these roles as a programmer, program supervisor and interim parks and recreation director. Mr. Riley serves North Carolina as NCRPA region officer and as a NCRPA awards & citations committee member. He earned a master’s of science in 2014 and has received the NCRPA Young Professional of the Year award (2014) and the NCRPA Arts & Humanities award (2012). We are proud to call each of you part of the NCRPA family and thank you for all you do for the profession in our state!